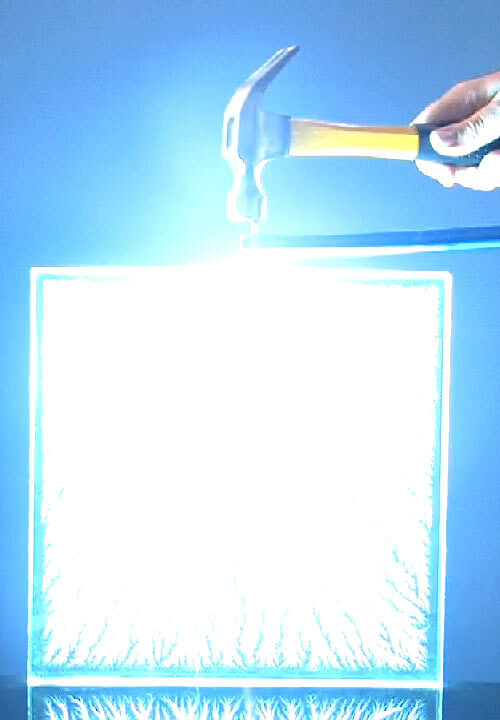 In which Theo Gray makes some acrylic Lichtenberg figures rather bigger than the ones I can afford. More detail in these excerpts from his book. 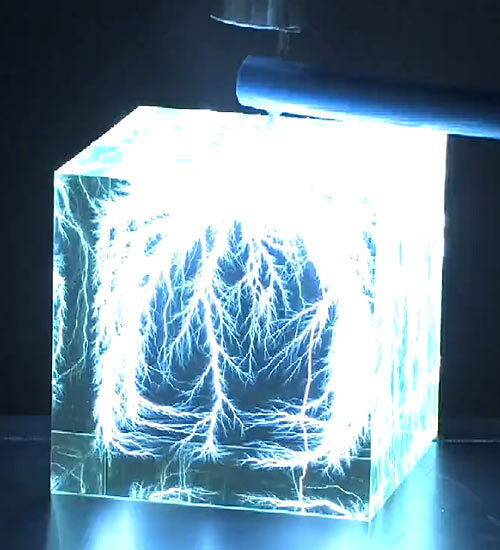 A new level of awesome has been achieved by the massive perspex cube-of-lightning. Interesting that there is still so much static sparking inside it afterwards. Big acrylic Lichtenbergs like these are rather expensive, but as I mention in that old post, you can buy smaller ones from Bert Hickman for quite reasonable prices. They've gone up a bit since I last bought one, but US buyers can still get a small one on eBay for $US31 delivered; there are some pretty affordable ones among the expensive monsters in Bert's Web store, too. Budget another few bucks for one of those little LED display-base things (an acrylic Lichtenberg doesn't look very impressive unless properly lit). This outfit also sells Lichtenberg figures online. Well, they would if they weren't out of stock of all of them :-). I've never found the final product particularly interesting (it looks a bit like a transparent tree branch in a cube) but damn, creating them is awesome! Now, THAT would be a cool case-mod. Though I doubt even today's 1000+ Watt PSU's could handle this, not to mention what the EMP would do to the innards of your PC. But still, would be cool case-mod. It's not the power that's missing, but rather the voltage. He uses a 5MeV electron beam, and according to this page chez boeing it can generate up to 10mA. That would give an output power of about 50kW, so in theory you're only about an-order-of-magnitude-and-a-half off. However, a multi-MeV accelerator isn't something you build in your garage. I must admit that I still find it hard to accept that the electrons would just sit there inside the block. I would have thought that they would at least migrate to the edges, and cause some corona effects in the corners or something. But apparently they just distribute evenly in the medium! Sounds like I still have a thing or two to learn about high-energy physics. I think, Popup, that the thing is that the plastic is so poorly conductive that the electrons can't migrate anywhere. Not until the voltage gets EXTREMELY high. I think I'd have an irresistable urge to try and rub my hand over the sheet and see if I could pick up some of that charge...Then poke the nearest person's ear. Really cool are would be really cool to see if you could do it yourself. I like how after the surge goes through a ton of static still remains for a while after.